Amazing! We’ve just reached 59,000 likes on our BERNINA USA Facebook fan page, and that means it’s time for another giveaway! 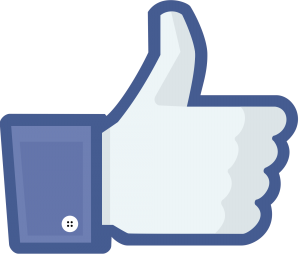 We quickly gained another 1,000 fans to hit 59,000 likes on our Facebook fan page—we love our fans! As a way to say “Thank You!” to all who join us at Facebook to share your love of sewing and creating with us, we are holding another special giveaway. If you are already a fan of BERNINA USA on Facebook, then you know that we’ve pledged to host a giveaway with a chance to win fun prizes like goody-bags, sewing books and even fabrics right here each and every time we gain another 1,000 likes through the end of 2013! Join in the fun by clicking over to our fan page, Like us, and be sure to keep your eyes open for our next giveaway. Are you planning on hand making gifts for the holidays this year? What is your favorite project to make and give for the holidays? Sweepstakes Rules: Open to residents of the 50 United States and the District of Columbia. One comment per fan. Comment must be submitted to the WeAllSew.com blog within 24 hours after blog post posting by September 12, 12:00 midnight Central Time. Winner will be chosen randomly. Winner announcement one week after sweepstakes ends. Congratulations to the winner of our 59,000 Facebook likes contest, WeAllSew fan jcrow54! 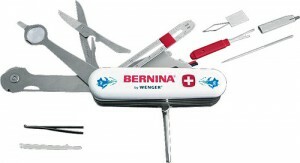 Enjoy your Swiss Sew-Essential tool! I love little pillows (i.e. 4″ x 5 “) with cross stitch or embroidered designs, especially on natural color fabric to hang on tree, etc. I’m planning on making gifts for close friends and family, and stuff that will ship safely for family across the country. Locally, I’m going to be making blown egg ornaments, but I’ll probably be making fabric ornaments for my cross-country family. I love to make gifts for the holidays. I usually make some home decor item or make a blanket or something for my family. I love to make things that they can use in their everyday life, those are the type of gifts I love to make and give. Every year I make hand-crafted gifts for family. Each year it is usually something different, last year was hot pads for the kitchen. This year I have a different project in mind but I won’t say in case any of my family members are members of this site…I don’t want to spoil the surprise. My favorite patterns for holiday gift-giving are useful items that I can make and customize for each recipient. That way everyone gets the same amount of ‘love’ and energy but each one is still thoughtful and unique. I plan to make a lot of gifts this year!!! My favorite is table runners. Easy to make many kind and you can always have a different look for the holidays or season. I love giving home/handmade gifts … my favorite is a fat-quarter bag! I want to make the Christmas gift quilt, I love, love, love this gig! I make personalized ornaments to mark each year for each of my grandchildren. I am making 31 denim “Texas” Christmas stockings this year. Hope I still like to do it when I finish! I will be making at least some of my gifts this year. My favorite to make is purses. This year I am going to make pot holders. I think placemats are a good idea to go along for my little brother who just bought his first house! I plan on making infinity scarfs. Very simple to make. Doll clothes for my granddaughter. I love to embroider and machine applique with my Bernina 580. Plan to monogram t-shirts, and purses for gifts. I make quilted hot pads and lots of embroidered snow flakes. One machine is stitching the snow flakes while I am sewing on the other machine. I try something new every year. This year’s is a secret, but my friends who drink wine will love it. I always make quilts for different relatives. Last year I made two for my two nieces. This year I’m making one for my mother in law and one for my sister in law. They were sad last year that they didn’t receive quilts. So, I already made one and am working on the second right now. I like to embroider towels or make sweatshirt jackets (embroidered and “blinged out”). Little things that are easy to make–pouches, that sort of stuff. Quilts are only for babies and weddings! Yes, I’m planning to make flannel quilts for two nieces and table setting for two sisters. More if I can get it done. This tool would sure help me go faster – hope I win! I will be making something..but have to decide what. I’m still mulling over ideas..skirts or aprons for the children, maybe purses or totes. The problem is coming up with something different every year! I usually make gifts, blankets, shirts, etc., but I have no idea what I will make this year! a nice warm quilt is the best gift since i live in a winter climate. I love making bags for my daughters and daughter-in-laws for the holidays. No plans to make gifts. I usually make something but haven’t thought about this year’s yet. I have made pillowcases for grandchildren and table runners for the homes in the past. I guess it is time to start this years projects isn’t it. My grandkids all enjoy having a new pair of fleece pants every Christmas. I try to make an afghan or quilt for the “big kids.” I make tiny crocheted snowflakes to give to friends and neighbors every year for their trees or windows, too. I love to make pillowcases and small quilts for all my grandchildren. I want to try and make zip pouches for my family this coming holiday season. I love to make coordinated pot holders and dish towels. It is something that everyone needs and uses daily. I do plan to make some gifts. I would like to make a simple jacket for a friend and some purses and pillows for others. …a sunshine quilt for someone is the Arctic Circle, where the sky is dark for many months of the year, except for a billion stars! I love making quilts for each member of our family. I’ve still got several more in the process of being finished! The look on each of their faces is priceless!!! I like to do bags or pajama pants. Something fast and relatively easy so I can whip one out for all of my list. I am going to make the grandson’s tote bags for their sports gear, the granddaughters some doll clothes, and some of the rest of my family, table runners and hot pads. For my co-workers, I am going to make some FSL ornaments. If I have time, I might make my parents a quilt! Guess I better get off the computer and get busy! I have already started Christmas gifts. Table runners and purses. I am also making my Grandson a quilt. I love giving something that I have made especially with my Bernina!! I am making Christmas quilts for gifts this year. Something that can be brought out each Christmas and become a tradition. I love to make quilts for my family. I plan to make pillow quilts this year for each of my 9 grandchildren. Yes, will be sewing all of my holiday presents. This year will be cassarole carriers and pot holders and aprons and mug rugs. Last year I made little bowl cozies for heating something in the microwave! Big hit! One year I made coffeecup cozies and potholders, too. I can not reveal this year’s sewn gift or it would not be a surprise! Yes, I do plan on making gifts for the holidays. I usually make embroidered items-ornaments,tree skirts, pictures,pillows, table runners and kitchen towels and mitts. Of course I’ll made some of the gifts! Last year my favorite was hats. This year I am working on crocheted dishrags and doll clothes. That little tool would be awesome. I try to make something useful for the home. This year it will be microwave hot pads for bowls. No more burned fingers for my family. I enjoy making and giving paperpieced potholders with Christmas themed designs. I’ve been told though that many of them never see the kitchen, they end up on walls or tabletops as decorations. I enjoy making flannel rag quilts as Christmas gifts. Ours stays out all year long. ☺ Thanks a bunch for the chance to win your awesome giveaway! I’d be beyond thrilled to win a Swiss Sew-Essential tool! I love to make table runners & pot holders for gifts. This year I am going to make pin cushions & sewing kits for my Daughters who are now 29 & 25. I always PLAN on making gifts for Xmas, but time seems to get the best of me. I finally got realistic and I try to make a quilt for one member of the family each year. That way I don’t stress out that all of them are not done. I only have to stress about one! I like to make a pine cone Christmas ornament every year. I like making embroidered hand towels with holiday themes. I like making embroidered tea towels for my friends. I made monogram pockets and stitched them on T-shirts for my daughter and her co-teachers. I have also made personalized ornaments for everyone in the family. It just varies from year to year… there is so much inspiration on the ‘net! Quilts are always in good taste! I love making and giving flannel quilts for Christmas. I do plan on making gifts this year. I want to make pretty kitchen towels, pot holders and aprons. Maybe some fabric baskets too. I like making small items, in the past I have made pincushions, aprons, and potholders. I think small zipper pouches may be on my list. I’ll be sewing and quilting things this year including mini potholders and mug rugs, a lap quilt or two, and quilted slippers for dear family members. Congrats, Bernina/We All Sew on your Facebook success! I will be sewing Christmas dresses for my granddaughter. Love to sew. Yes. I love to make embroidered kitchen towels using my 830 and serger. Also fun are some treat bags made in the hoop for my staff at work. I am making 5 lap quilts with Christmas fabric for our 4 children and their families as well as for an doctorate exchange student who we call unofficially adopted. My favorite holiday item to make: Christmas stockings with quilted fabric. Once I have the pattern, can do so much to make each individual. Have made for all my kids and two grandkids. And easy to make for charity holiday bazaars. Also going to make holiday potholders this year. Yes, I am planning to make gifts! Beautiful lavender sachets are one of my favorite gifts to make! My favorite project to make and give for the holidays would definitely be a quilt! And yes, I do have some planned for this year. Winning this would be super sweet! I always keep a small knife like this in my purse, and having a Bernina one that’s all about sewing would make it the best one ever!!! My favorite gifts to make are tote bags. I love trying out all the great bag patterns. YES! I love making handmade gifts for the holidays. My favorite things to make are rag quilts and pieced stockings. I love to make gifts for my family and friends; Christmas stockings, quilts or anything the receiver might enjoy. My favorite gift to make are Christmas ornaments. Pillowcases, simple and easy to make them. I am making quilted table runners for my daughters. I am new to quilting but have been sewing for years and love to make ruffled holiday skirts for my granddaughters and felt projects for the grandsons. Yes I always try to make some gifts. This year I am going to make little purses for our local PCAP women, PJ bottoms for the food bank Xmas house and pillow slips. I will be making quilted bread basket covers to keep homemade bread warm ! I plan on making ornaments for friends and family! (I make them for everyone!) They are little paperpieced people (usually holding hands). I am making holiday themed quilted table runners for my family. Quilts, purses, anything that I think they will like, or that makes me think of the receiver. I will be making Mimi G Styles folding makeup travel case. I love her style. Small wallhangings with embroidery designs for the holidays and shirts with embroidery on them. I am making make-up brush bags with machine embroidered monograms. I am thinking of making a quilted bag for a family member. I also like making placemats and potholders. I’ve been collecting t-shirts all year for family members. Now it’s time to start sewing. I’m guessing everyone will be surprised and pleased when they open their own special t-shirt quilt. I plan on making stocking stuffers like small zippered bags and tissue holders. Small projects are my favorite because I feel like I accomplished a lot. Yes, I plan on making quilts and towels. I am always on the lookout for things to make with yoyo’s! In about a week, I’ll dig through my Christmas Fabric scraps (I buy FQs on clearance) and start cutting out circles. Throw them in a basket & start yoyo-ing while watching TV, waiting at the doctor’s office, etc. By the end of October, I’ll have a TON of them. Then I start making ornaments, or whatever cute little pattern I’ve found by then. Nothing too hard. . .after all, it’s the holidays & I don’t want to stress over these little gifts of love. It depends on the person who I’m making a gift for. This year I’m making Xmas tree skirts for my 2 nieces and nephew. They all liked the one I made for their sister last year, so I guess I’ll be busy with those. I also make table runners or totes as gifts. I love sewing Christmas projects and Christmas gifts. Holiday table runners are my favorite things to make but am always looking for new and quick things to make. I am making holiday gifts! I love making purses or wallets for the ladies in my family and dresses for my baby girl and my niece. Also, this year, I’m making little felt fruit and veggies to go with my daughter’s new kitchen she’s getting (from grandparents)! I love making ornaments for my family and friends using my embroidery module. My personalized novelty fabric pillowcases are a favorite in our family. Sometimes I add embroidery, sometimes not. I will be helping my 9 year old granddaughter make PJ bottoms for family. Love teaching her to sew and she loves to create!! I always try do homemade gifts! Boxers for my son and husband, skirts for the girls. I usually make tea towel calendars and napkins for friends. I love making lapquilts for my family! Congrats on 59K fans! Last Christmas I made quilts for one granddaughter and one daughter, so this year I hope to get a couple made for another daughter and granddaughter, plus some dance and gymnastic bags for two more granddaughters. So I better get busy! I like to make fleece blankets or cross-stitch little Christmas tree ornaments. Although, this year I’m trying to make my husband a felt stocking–to match the one my mom made for me when I was little. I love to surprise someone in the family with a quilt each Christmas. Yes, I’ve already started. I love to do holiday themed items – place mats, runners, small quilts – embroidered and appliqued with seasonal designs. I will sew tags for suitcases. They are small enough to make a few and will help my family to not grab the wrong suitcase at the baggage claim. (Just happened!) They seem to be a nice litlle Christmas gift that can be used all year long. Are you planning on hand making gifts for the holidays this year? Yes, I will be making hand gifts for the holidays this year. I love to make the small stockings for the cutlery placement on the tables. I use sequins, beads and trims with using the blanket stitch on the outside borders. What is your favorite project to make and give for the holidays? I make a matching table runner for the table by machine-sometimes with embroidery motifs. Whatever the theme is for the stocking, I also make a napkin to match with the sewing machine and serger. The guest will take home the stocking and the matching napkin as a hostess gift. I love the holidays. They are wonderful to create and make gifts! I love making things for my grandchildren for the holidays! This year I think I am going to make them quilts! I love to make embroidered linen towels. Also tote/purse. Small wallhangings and small quilts are also my favorite. I probably won’t be sewing many Christmas gifts this year as I will be busy sewing dresses for my wedding Dec. 28. But I love to make gift for friends and family. I like to sew things they can use like shopping bags and aprons. Making large quilts, small quilts, wall hangings, gifts for friends – I love sewing all of it as long as I can do so with my Bernina!! I will make some personalized fsl (free standing lace) wine glass ids for my family and friends. You place the fsl ids around the base/foot of the wine glass, so you don’t mistake your wine glass for some one else wine glass. I use my embroidery module and Designer Plus software to make them. I’ll make pillows and pillow cases for Christmas. I’ve already started making lap quilts for the kids. Possibly will make wine bags and give as gifts. Yes making gifts – towels.table runners, pillows, clothing, stuffed toys…love it all! Last year I enjoyed making fleece scarves that I embroidered with design for the Bernina holiday collection. I think I will make some more this year. I plan to make some super glam Christmas cards this year. I can use my Bernina 300 Series machine to sew fabrics and trims onto card stock, and I can use my Bernina serger with decorative threads in the loopers to create thread chains, which will make nice borders for the cards. If the stars align I’ll get some quilts done! I will be sewing some whimsical potholders for Little hostess presents. Nerd-themed quilts. I plan to use pixelated 8-bit looking patterns to recreate retro video game chracters. I am planning to make fabric books for my parents and in-laws. I will use applique, photo transfer and quilting. I will also use the new Tim Holtz fabric line to bridge my love of paper crafts and mixed media with quilting. Yes, I will be embroidering tee shirts and other items for my 2 year old niece. I have made tree skirts, table squares, lap quilts, and wall hangings. Yes, I do plan on making holiday gifts – doll clothes for my grandchildren dolls. Yes, I like to make something for the grandchildren each year. So far I have not decided on this years project. But, I do something different each year, as they change and grow. I will be making tree skirts for my adult children, and pajamas for the grand kids this Christmas. I love making sets of embroidered hand towels to have on hand for hostess gifts. This year I am planning on making placemats with matching napkins as gifts for my family. I plan on sewing some cat toys, and an elf costume for my friends dog. I will be quilting 2 tops; one for my daughter and one for my grandson. I love the tote bags. You can never have too many tote bags! The foot book is my fav! I don’t have any “sewing” friends to share the posts with, but they love the gifts I make using the tutorials. I like every WeAllSew, but the foot book, any purses/tote bags, and quilting projects… OK like i said, everything. I like all of the things & projects you post…I do all kinds of sewing.